Make way for another big player entering the Internet of Things space. Amazon today is announcing its long-awaited IoT platform for AWS at its re:Invent developer conference in Las Vegas. 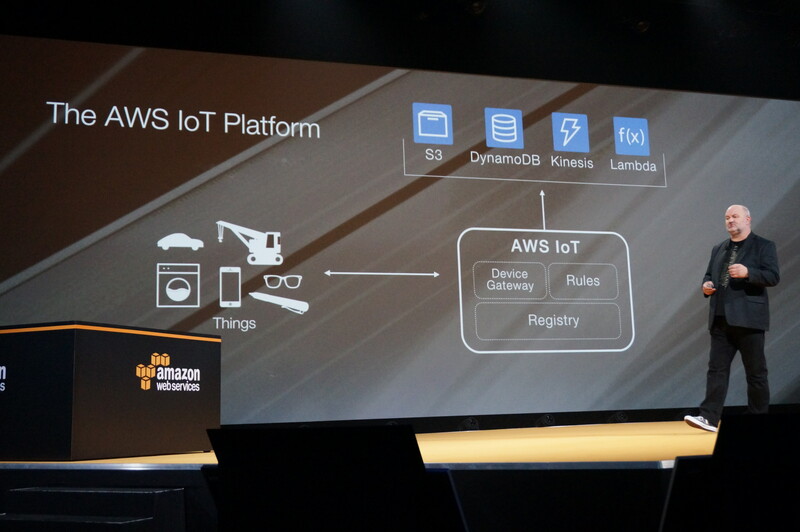 AWS IoT will integrate with Lambda, Amazon Kinesis, Amazon S3, Amazon Machine Learning, and Amazon DynamoDB to build IoT applications, manage infrastructure and analyze data. “Connected does not necessarily mean useful,” said Amazon’s CTO Werner Vogels during the keynote today, and indeed this is what Amazon is aiming at tackling with its mega platform: a place where the many different strands of creating services for disparate connected objects can come together into one place to be run in a cohesive way (all ultimately bring traffic and revenue to one consolidated company, too: Amazon). Vogels notes that the platform will include a device gateway, a rules-based engine, a registry where you keep data about your devices (“Give me all devices in this particular room,” is the example Vogels mentioned) and also a feature that Amazon calls Device Shadows, which lets you track data about devices when they are offline and send it back into the system once they are back online. The company acquired IoT platform 2lemtery earlier this year, so today’s announcement doesn’t come as a huge surprise, especially given that some of Amazon’s competitors like Microsoft have recently made IoT support one of the cornerstones of their cloud computing strategies. The platform will make it easier for developers to ingest incoming data from devices using standard gateways and protocols like MQTT and HTTPS. As with other AWS services, pricing for the IoT platform is based around what you use with no minimum fees. Prices are based the number of messages published to AWS IoT (Publishing Cost), and the number of messages delivered by AWS IoT to devices or applications (Delivery Cost). As a sweetener to keep you in the AWS ecosystem, pricing does not include deliveries to certain AWS services, specifically Amazon S3, Amazon DynamoDB, AWS Lambda, Amazon Kinesis,Amazon SNS, and Amazon SQS. Amazon notes that a message is a 512-byte block of data processed by AWS IoT.